Since 2014, the yearly meeting of the French research structure GDR GeoSto has been preceded by two introductory courses. This book contains five of these introductory lectures. The first chapter is a historically motivated introduction to Stochastic Geometry which relates four classical problems (the Buffon needle problem, the Bertrand paradox, the Sylvester four-point problem and the bicycle wheel problem) to current topics. 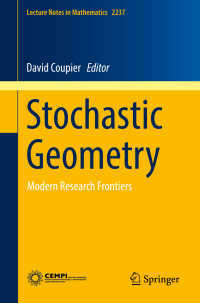 The remaining chapters give an application motivated introduction to contemporary Stochastic Geometry, each one devoted to a particular branch of the subject:&nbsp; understanding spatial point patterns through intensity and conditional intensities; stochastic methods for image analysis; random fields and scale invariance; and the theory of Gibbs point processes. Exposing readers to a rich theory, this book will encourage further exploration of the subject and its wide applications. -&nbsp;Some Classical Problems in Random Geometry. - Understanding Spatial Point Patterns Through Intensity&nbsp;and Conditional Intensities. -&nbsp;Stochastic Methods for Image Analysis. -&nbsp;Introduction to Random Fields and Scale Invariance. -&nbsp;Introduction to the Theory of Gibbs Point Processes.